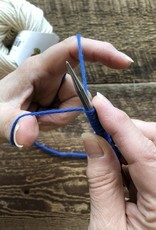 Cast On Bind Off - Spun Fibre Arts, a local and online yarn store specializing in natural fibres. The beginning and the end of each project is just as important as what is in the middle. The cast on and bind off should be in keeping with the rest of the project. Students should have a basic knowledge of traditional cast on / bind off methods and knitting in general. Materials Required: Students should bring 5 or 5.5 mm needles and DK or worsted weight yarn (light colour is recommended).